A Galápagos sea lion. Photo courtesy Wikimedia Commons. I was sitting at a bus stop at the corner of 40th and Telegraph in Oakland a few months ago when an older man sat down next to me. He was slender, wearing fitted black trousers and a slightly oversized sweater of the sort that Dwayne Wayne might have worn on A Different World. His dark face was etched with deep lines. He started telling me, his voice thick with southern twang, about his latest trip to Kaiser to get the dressing changed on a wound — from what, he didn’t say. It had taken too long and he’d been given the runaround and he had to go back tomorrow to do it all over again. I nodded and smiled, and said a few encouraging words here and there. He was pleasant enough. My enjoyment of the banter evaporated, replaced with shame as a hot flush spread across my face and my stomach turned to stone. I’m plus-sized. Zaftig. Curvy. Chubby. Voluptuous. Fat. For each of us, body fat settles in different spots. Our asses. Our thighs. Our arms. In my case, it’s mostly my belly. And my chin. Even when I was at my thinnest, I still had a roundness under my jaw. When I look at other plus-sized folks, I notice that the ones I find most beautiful are the ones with sharp jawlines. No “jelly rolls” underneath. Google assumed I’d made a typo. 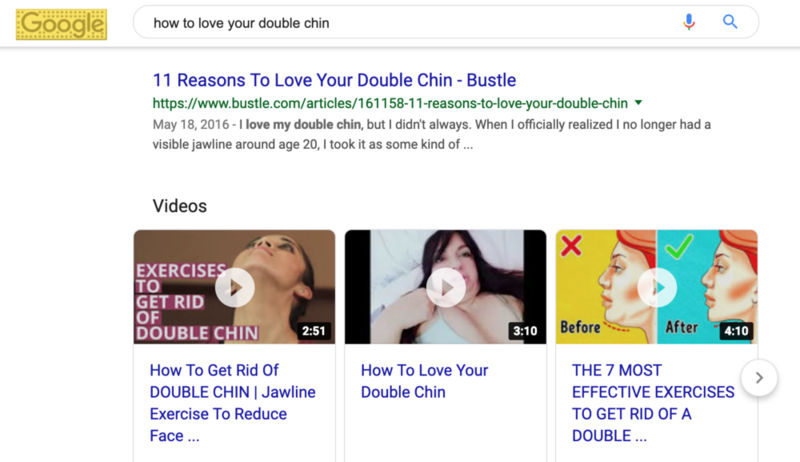 “Did you mean ‘how to lose your double chin?’” Pages of search results related to cosmetic surgery, jaw exercises or weird nighttime contraptions followed. Great. Even the search engines were fatphobic. I showed the results to my partner, D., who works at Google, though not in the search-engine department. We tested the results again in an incognito window to make sure Google was showing this “correction” to others as well, and it was. Google has internal forms that allow employees to report when they notice something is awry; those reports do make their way to the right teams, sooner or later. A few months later, D. checked the search query again and realized Google was no longer spell-correcting the phrase, and was offering better results in the links. The body-positive ones are still mixed in with exercise videos and other body-shamery, but it’s better than it was. I still struggle with loving this part of myself (despite how delicious a jelly roll is). But at least I contributed to something that will make it easier for other people to love theirs.